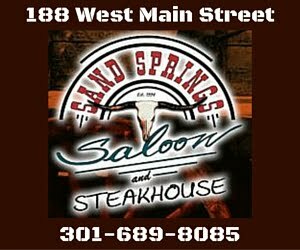 On November 22nd, a staple Frostburg downtown business is celebrating the start of their 30th anniversary year! They sell comics, biographies, children’s stories, puzzles, classic fictions… Any guesses? It’s Main Street Books! MSB has been a part of Frostburg life since 1989 when Fred Powell moved to Frostburg with plans to open some type of business–what kind of business, he had no idea. 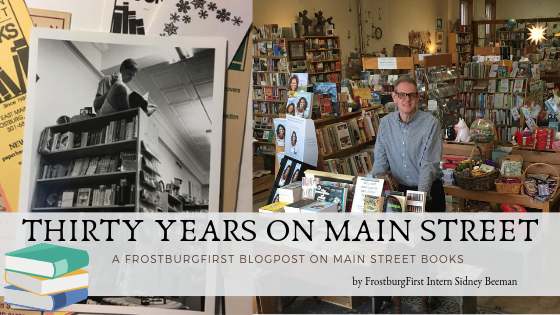 Accompanied by his 6-month-old, he traveled around and asked local business owners what Frostburg needed, and when one suggested a bookstore, the idea was a hit! The store originally opened at 10 East Main Street on the day after Thanksgiving with only two card racks and 200 books! “I had read a book by an author named Paul Hockin, and the book was called growing a business, and that’s literally what I did. He says to start very small and I couldn’t be much smaller,” Fred remembered. The store eventually got bigger and bigger. With the community need for books growing, after 10 years in his old location Fred moved MSB to its current location in 2 East Main Street. According to Fred, his favorite part about owning the business is talking to people. “Product comes and goes, but the people are constant.” From locals to people half an hour away, to customers across the country, MSB has created a community that can gather in an intimate place to buy books, to peruse the store, and to build a relationship with the booksellers, including Fred. Many of the relationships Fred has created are long lasting, some lasting the entire 30 years of the bookstore’s existence. Fred states, “There is an incredible romance about books and booksellers, so once people find out that you do this, they are like oh my gosh! It’s an automatic door for conversation.” The magic that comes from owning a bookstore and being a bookseller has allowed Fred to connect to the community in many ways. Not only does Fred get to be an integral part of the life of a reader, but he is able to cultivate the idea of what a bookstore is for the people of Frostburg. MSB has also established itself as a cultural hub for Frostburg; they sell tickets for movies at the Palace Theater, do book sales for the local elementary schools, or hold readings or music for events like Storybook Holiday. Fred states, “When I started I didn’t have a lot of money to donate, but I realized I could donate myself.” So over the years Fred and MSB have sponsored or worked on many boards and event committees, allowing MSB to become integrated into Frostburg life from more than just its bookstore status. For many, Main Street Books is more than just a bookstore, it’s a magical place. So, next time you are on the hunt for a good book to read, or just a unique gift for someone special, stop by Main Street Books and see all they have to offer. We would like to congratulate Main Street Books on 30 successful years, and we have no doubt that there will be many more to come!